Jan. 30, 2018 - On January 26, 2018, Komatsu Ltd. (president & CEO: Tetsuji Ohashi) signed an agreement to acquire from Prenbec Equipment Inc. (CEO: Charles MacLennan), a company based in Quebec, Canada, the Quadco and Southstar forestry attachment operations, excluding the forestry equipment businesses of Tanguay and Forespro delimbers. The acquisition will be made through a wholly owned subsidiary of Komatsu in the United States and is expected to close in February 2018, subject to completion of the closing conditions. 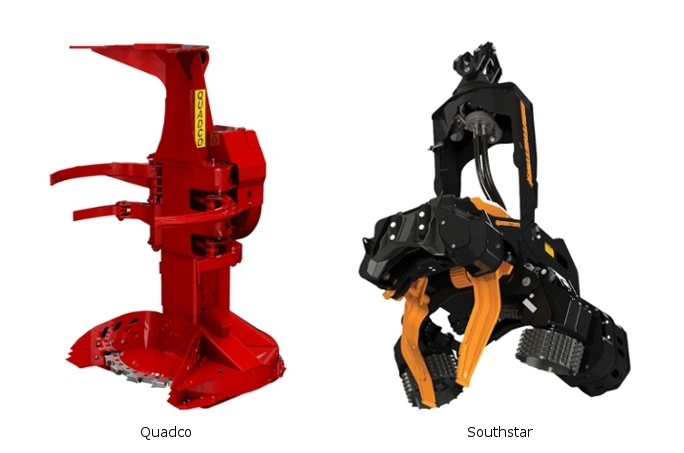 By adding the Quadco felling heads and Southstar large harvester heads to the existing lines of Log Max and Komatsu small and medium-sized harvester heads, Komatsu will become an industry leader in forestry attachments. This will allow Komatsu to offer its customers a full range of forestry attachments. Quadco and Southstar will continue to operate as independent companies within the Komatsu group following the completion of the acquisition and will maintain their existing sales networks. In order to offer improved value to customers, a forestry attachment division within Komatsu Forest AB will be formed, which will manage the Quadco, Southstar, and Log Max brands. Komatsu anticipates that this acquisition will have no material impact on its consolidated business results and performance for the current fiscal year ending March 31, 2018. In April 2016, Komatsu launched a three-year mid-range management plan (2016-2018) under the slogan "Together We Innovate GEMBA Worldwide –Growth Toward Our 100th Anniversary (2021) and Beyond". In line with this plan, Komatsu decided to make this acquisition and expand its forestry attachment business. Forestry attachments are classified into two categories: the Cut to Length (CTL) method, which involves the use of a harvester and forwarder and is popular in Europe, and the Full Tree Length (FTL) logging method, which involves the use of a felling head attached to a base-machine and a skidder, which is popular in North America. The global market for forestry machines, including forestry attachments, is continuing to grow at a rapid rate. It is anticipated that there will be particular growth in the North American market, where FTL is the dominant method. Komatsu will acquire the forestry attachment operations of the Quadco and Southstar brands through a wholly owned subsidiary. Housing demand improving in the U.S.